If the District was ranked as a state, D.C. would be the greenest building state in the nation by one measure, and one of the top ranked just by raw square footage. WASHINGTON — If the District was ranked as a state, D.C. would be the greenest building state in the nation by one measure, and one of the top ranked just by raw square footage. The U.S. Green Building Council’s Annual Top 10 States for LEED Green Building says Illinois ranks No. 1 on this year’s list for LEED-certified building, with 3.43 square feet of LEED-certified construction per capita. By that measure, the District would far and away outrank Illinois, at 19.3 square feet per resident. And the District holds its own on a purely square footage measure, with 11.6 million square feet of LEED-certified construction now completed in D.C., which would rank it No. 6 when compared to states, right behind Colorado. “A continued strong performance from Maryland and Virginia has reaffirmed the Mid-Atlantic region, which includes Washington D.C., as the epicenter of green building,” the USGBC says. Maryland’s 17.7 million square feet of LEED-certified construction gives it 3.06 square feet per capita, ahead of Massachusetts. 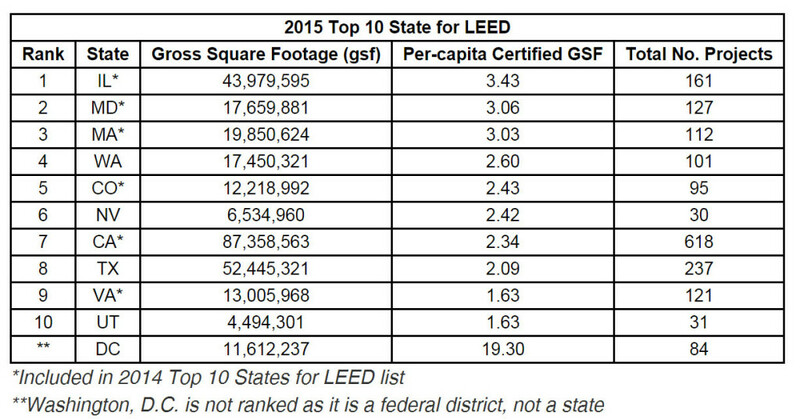 Virginia, has 1.63 square feet of LEED-certified construction per capita, ranking Virginia No. 9 this year. 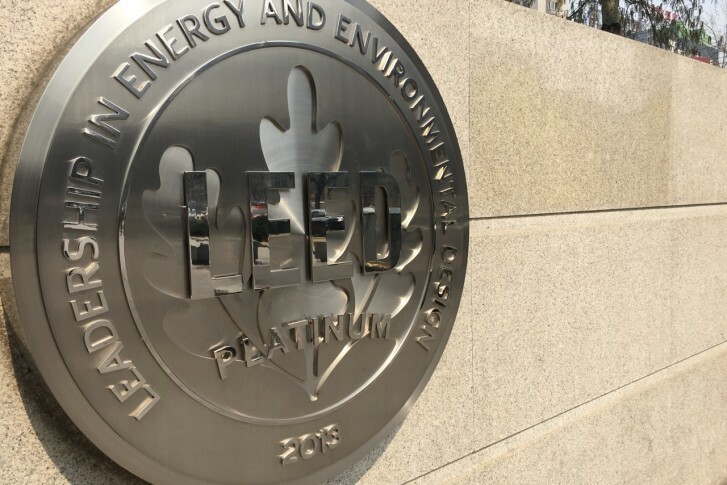 Collectively, 1,633 commercial and institutional projects became LEED certified within the top 10 states in 2015, representing 274.9 million square feet.